With so many superbikes launched in 2018, it was hard to pick just one for this award. So we didn't. Here are three. Multiple bike brands launched, updated, or redesigned aero bikes in 2018, and each one came with its own focus: speed, comfort, stiffness, or a combination of all three. It seemed as though every manufacturer was on the same launch schedule, releasing its superbike in the days leading up to the Tour de France. So, it should come as no surprise that our Bike of the Year is an aero bike. It also shouldn’t be surprising that we had a tough time choosing just one. Ultimately, we decided that three bikes deserved special attention: Trek’s Madone, Specialized’s Venge, and Cervélo’s S5. While there are plenty of other bikes that merit a shout-out (Cannondale’s SystemSix and Ridley’s Noah Fast), the aforementioned trio is dictating the future. 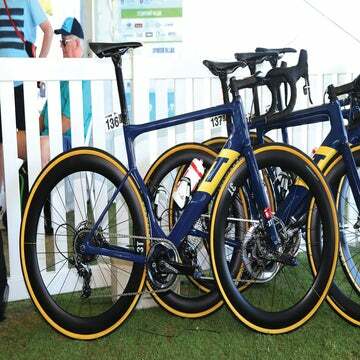 These bikes redefine the aero category. Beyond that, they each give us an indication of what bicycles will look like in the not-too-distant future: The categories are blending, and herein we find hints of what’s to come. These are the fastest, most capable bikes in the world. So, this year we didn’t choose a bike of the year. Instead, we chose three, each fine-tuned for specific purposes. For years, conventional wisdom dictated that aero bikes had to sacrifice comfort in pursuit of aerodynamic performance. Trek turned that idea on its head with the launch of its Madone aero bike in 2015. No longer did you need to jeopardize your spine for a few extra watts. Fast forward to 2018 and the Madone has gotten a makeover. It looks fairly similar to its predecessor, but appearances hide some truly unique comfort and aerodynamic tweaks. They make the Madone ideal for the racer who craves smooth speed on daily training rides. The most notable improvement is hidden within the top tube/seat tube junction. The rear IsoSpeed decoupler is now adjustable, using a dogleg-shaped pivoting piece of carbon. A slider controls how much compliance you get and a damper controls the rebound. The Madone rides like a Cadillac inside an F1 car. Trek also addressed customer concerns over cockpit adjustability. With the one-piece handlebar and stem, riders can now customize cockpit positioning. Still, engineers maintained wind-cheating gains by incorporating aerodynamic tube shapes. The only downside to the new Madone is its weight. All those decoupler components add too much of it. That’s a problem if you’re interested in long days in the mountains, but not so much if your riding style tends toward rollers and flats. The Cervélo S5 holds its speed better than any bike we’ve ever tested. Perhaps that’s a testament to Cervélo’s unique handlebar/stem design, which resembles an old-school mountain bike stem with two arms that diagonally extend to the handlebar. This increases stiffness, of course, but that’s not really what matters. Cervélo has eliminated another round tube shape (the stem), which allows air to flow more smoothly over the top tube. Before you criticize the cockpit, it’s important to note that this integrated system is adjustable. It also has one of the more comfortable aero bars we’ve tested since the tops flare backward to accommodate your wrist’s natural positioning. That’s only part of the equation. Cervélo tested the S5 in the wind tunnel with a dummy rider, enabling engineers to analyze air movements over tube shapes in more real-world situations. The final design helps air flow more smoothly over tubes based on how that air also moves over a rider’s body. That’s why Cervélo claims this is the fastest bike in the world. Cervélo focused on torsional stiffness, too. This keeps your wheels in plane for tighter steering and prevents the bike from fighting you during sprints. The big gains in stiffness make the S5 jump eagerly when you do. In other words, the S5 does everything you expect an aero bike to do: get you where you’re going, fast. It’s no comfort machine like the Madone, and it’s not trying to borrow characteristics from an all-rounder like the Venge. The S5 knows what it wants to be. And it’s a good one. From a distance, the Venge is just about indistinguishable from its all-around sibling, the Tarmac. That is a very, very good thing. This is what bikes are going to look like going forward. That’s because Specialized didn’t simply make the tubes deeper and call it “aero.” Engineers analyzed which tubes could be elongated and which ones could be slimmed to save weight. The new Venge, while far slighter in appearance than its predecessor, the Venge ViAS, is actually more aerodynamic. And it’s a pound lighter than the ViAS, which in turn makes it just under a pound heavier than the Tarmac. Specialized sought the middle ground between weight and aero, found it, and began perfecting it. As a result, the Venge climbs better than just about any aero bike we’ve ridden. Handling on descents feels responsive but planted, which makes it less twitchy than a Tarmac, but far more reactive than the Venge ViAS. This incredibly competent handling is what leads us to believe that this is the future of bikes: A combination of aero-fast with all-around response. The Venge nails it. That aside, the Venge is near perfect. Adjustability, aerodynamics, enough comfort to ride all day, impeccable handling, aesthetics that don’t scream dorky—it’s all there. You could mistake it for an all-rounder, and someday soon that sentiment won’t be a mistake at all.